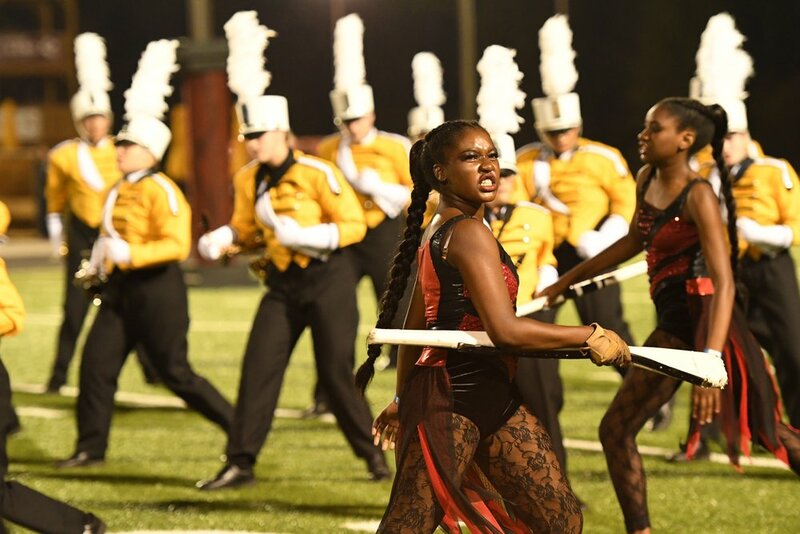 The Sprayberry Guard is one of the finest color guard programs in the Southeast. The guard program is comprised of three highly decorated programs. Students participating in the guard program will receive specialized training in dance, flag and performance weapons such as rifle and sabre. The Fall Guard is the marching guard for the Sprayberry Band of Gold. The Winter Guards are separate performance ensembles that compete in the Southern Association for Performance Arts (SAPA) and the Winter Guard International national (WGI) Winter circuits. Sprayberry Guard students have an opportunity to spin and perform during the full school year. The Fall Guard is the marching guard for the Band of Gold Marching Band. Students in the Fall Guard are considered members of the marching band. Students in the guard play a vital role in the marching field production as well as travel to all home and away football games, competitions and parades. Auditions for the Fall Guard occur in April with secondary auditions in late May. The Varsity Guard is designated for our advanced color guard students. Students in the Varsity guard will compete both in the SAPA regional WGI national circuits.The Varsity guard will do a full winter guard production. Students in the Varsity guard must exhibit a high degree of skill in one or more color guard performance categories. These categories can include Movement, Wooden Rifle, Saber, or Flag. The Varsity students are held to the highest performance standard for the Sprayberry Guard. Students must attend Sprayberry High School and be in good academic standing. Auditions for the Varsity Winter Guard occur in October and the season ends in early April. The Junior Varsity Guard is designated for beginner and intermediate color guard students. 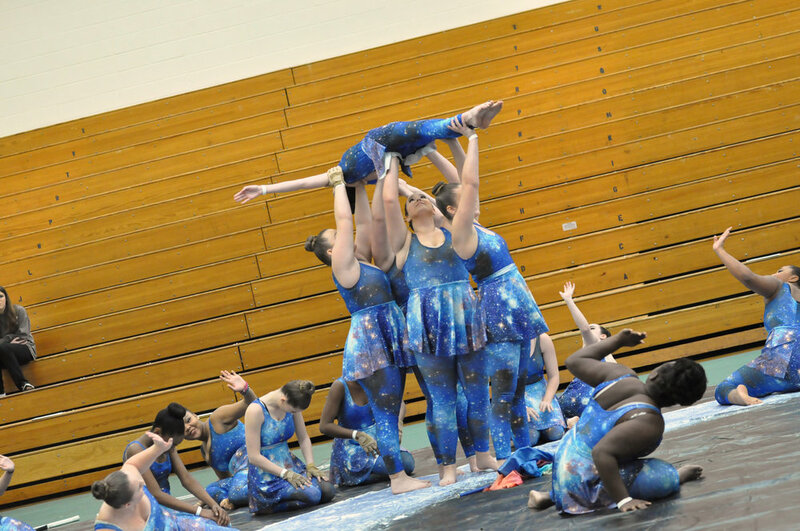 Students in the JV guard will compete in the SAPA regional circuit and will do a full winter guard production. The JV Program will focus on developing beginning and intermediate movement and equipment fundamentals. Equipment may include Flag, Wooden Rifle and Saber. Students must attend Sprayberry High School and be in good academic standing. Auditions for the Junior Varsity Winter Guard occur in October and the season ends in early April. Winter Guard is an indoor color guard activity. Unlike traditional color guard, winter guard is performed indoors, usually in a gymnasium or an indoor arena. Performances make use of recorded music rather than a live band or orchestra. Winter guard ensembles perform at judged competitions officiated by local and regional associations using criteria developed by Winter Guard International (WGI). The Sprayberry Winter Guards perform in the Southern Association for Performance Arts (SAPA) circuit. www.sapaonline.com SAPA is a regional circuit serving Georgia, Alabama and Tennessee. The Varsity Guard performs in both the SAPA circuit as well as the WGI international circuit. The winter guard program functions as an auxiliary performance ensemble of the Sprayberry High School Band. All winter guard activities will be facilitated and governed by the Sprayberry Band and its Booster Organization (SBBA). Guard auditions are held for 3-4 days on the Sprayberry High School Campus. Auditions for guards are open to any Sprayberry High School student that meet the extracurricular participation requirements. No prior experience is required with the exception of students wishing to make the Varsity Winter Guard. Varsity students will need to have significant dance or equipment training to meet the standards for placement. During the audition clinics students will be taught both a dance and flag routine that must be performed during the audition process during the final day. The students will be placed on the guard based off of the results of their performance. Students not meeting the standard will not be placed in the guard program.